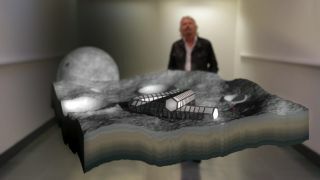 Virgin's April Fools' Day joke for 2014 involves building a lunar hotel on the surface of the moon. Image uploaded April 1, 2014. From a billionaire to a respected science journal, everyone is getting in on the ridiculous April Fools' Day fun. A few of the more elaborate jokes flying around the internet today (April 1) involve spaceflight and astrophysics. While this makes my job a lot harder, it's also pretty fun for anyone looking for entertainment on the web. Virgin — the firm responsible for the private spaceflight company Virgin Galactic — "announced" the creation of a new enterprise called Virgin Buildings. The new project purportedly aims to create "the world's greenest skyscrapers," including one built in the shape of SpaceShipTwo, Virgin Galactic's suborbital spacecraft expected to make its first flight with passengers later this year. Virgin's hoax also details plans to build the first hotel on the moon. We haven't confirmed that this is an April Fools' Day prank, but Virgin does something like this every year on this day, so we're pretty confident. The company's billionaire founder Richard Branson made the announcement in a video that you can watch below. ScienceNOW, the news arm of the journal Science, played its own prank on unsuspecting astrophysics fans today. The news organization's offering for April Fools' Day comes in the form of the ridiculously titled story, "Scientists Find Imprint of Universe That Existed Before the Big Bang." The story details a new finding from a fictional scientific instrument called "TRICEP" — a clear send up of the BICEP instrument that detected signs of primordial gravitational waves, the smoking gun of the Big Bang, a few weeks ago. The story claims that TRICEP is helping scientists like "John Blutarsky" and "Eric 'Otter' Stratton" (both characters from the movie "Animal House") see the universe before the universe ever existed. Oy. Spaceflight Now, one of Space.com's partner websites, also published a pretty great April Fools' joke for 2014. The jokey story claims that NASA actually mixed up the names of two of the space agency's space shuttles, calling Endeavour Atlantis and vice versa. "Curators at museums in Florida and California, were reeling after NASA officials briefed them on the mistake," Spaceflight Now wrote. "At the Kennedy Space Center, where the shuttle formerly known as Atlantis went on display last year, visitor center employees were counting the cost of the mistake." Virgin's April Fools' Day joke for 2014 involves a building in the shape of SpaceShipTwo. Image uploaded April 1, 2014. What's the one thing that spaceflight is missing today? Italian food, of course. Italian restaurant and market Eataly, based in New York City, is planning to launch their food into orbit with "Eatalian astronauts" and the "Eatalian space shuttle." A link on the Eataly website makes it clear that this is an April Fools' joke, but I bet the astronauts on the International Space Station wouldn't mind getting some fresh pasta courtesy of the Eataly space shuttle every now and then. Are there more space-flavored April Fools' Day pranks that we missed? Let us know about them in the comments.